Another Applejack cocktail, the Fall Monty is perfect for a crowd! Peel the lemons, carefully avoiding the pith; add peels to sugar in a large bowl and gently muddle. Let sit for 15-20 minutes. Add the tea and stir until sugar is dissolved. Add sherry, applejack, lemon juice, and cinnamon syrup; discard lemon peels and stir to combine. Pour into a punch bowl, and chill. Immediately before serving, add cider. 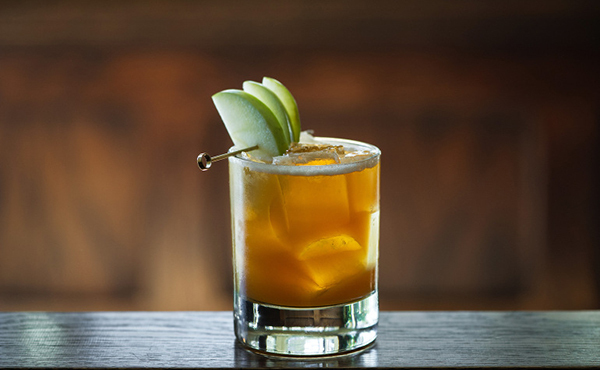 Garnish each glass with a cinnamon stick and apple slices. Notes: To make cinnamon syrup, add 2 parts sugar to 1 part water in a pot over medium-low heat. Add handful of crushed cinnamon sticks and heat until sugar is dissolved. Allow to sit for a minimum of 8 hours, then remove cinnamon. Bottle and store in the refrigerator; add a small amount of vodka to stabilize the syrup. And cinnamon syrup isn't just for fall cocktails–though it's definitely divine in them; use it on pancakes or French toast, sweeten your tea, or add a little kick to mulled cider or wine. Cheers! Image by Daniel Krieger, recipe from PUNCH. Oooh I love the cider elements and great photography!